Delhi Guest Teacher, Edudel Guest Teacher, Edudel Application Form, guest Teacher Result, Edudel Guest Teacher Online Form, Guest Teacher Recruitment, Guest Teacher Salary, Delhi Guest Teacher TGT PGT PRT Result/Merit List 2017 - EDUDEL Guest Teacher Final Appointment / Joining Letter at www.edudel.nic.in. Latest Updates (18.11.2018) - List XIV for Various Zones has been released for Edudel Guest Teacher on official website. 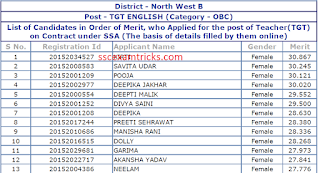 Download All the selected candidates list for the posts of Guest Teacher in Edudel Delhi. The list of selected candidates have been finalized by the department and the shortlisted/ selected candidates are called for joining/ document verification in the month of March 2018. The links for final list is given as under - See latest news on 26.02.2018 under next heading. EDUDEL Guest Teacher Recruitment 2017 Online Application Available Apply Now -Schools of Directorate of Education has announced recruitment of 272 Guest Teachers and online applications has been started from 13th May 2017 on official website at www.edudel.nic.in. The last date to apply online for these posts are 06th June 2017. 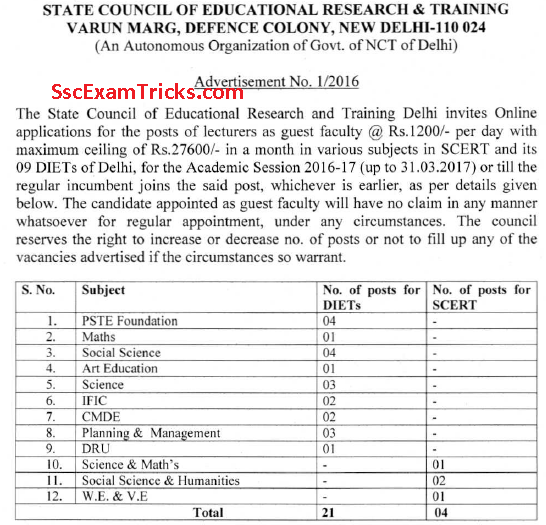 Delhi Guest Teacher Recruitment 2016-17 has been announced through an official notification on 26th August 2016 in which online application forms are invited to fill 25 posts of lecturers in DIETs and SCERTs. The Guest Teacher will be paid on the basis of 1200/- per day or a maximum salary of 27000/- per month. The academic session will be ended on 31.03.2017. The interested and eligible candidates can download official notice and apply online from the direct link available here. Latest News Delhi Guest Teacher Result 2015-16 Edudel.nic.in Check Selection List for DIET & SCERT: It is the latest news that Delhi Guest Teacher result is going to be announced on December 2015 on www.edudel.nic.in for 50 posts of Lecturers as Guest Faculty Pay Scale 1200/- per day with a maximum of 27600/- per month. The Delhi Guest Selection / Joining list for DIET & SCERT (various subjects) for the academic year 2015-16 is expected to be announced in the mid of December 2015 (after the station allotment of SSA Contract Teacher for TGTs & PRTs). Earlier Edudel invited online applications for eligible candidates from 18th November 2015 to 25th November 2015. The submission of hardcopy of the application form was not permitted and no documents were required to submit online by the candidates. 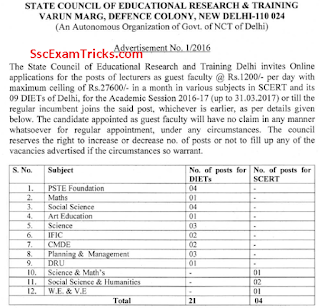 The result of Delhi Guest Teacher (Lecturer) result will be announced on website of SCERT. You can download your result, merit list, selection list for DIET & SCERT from direct link given below. 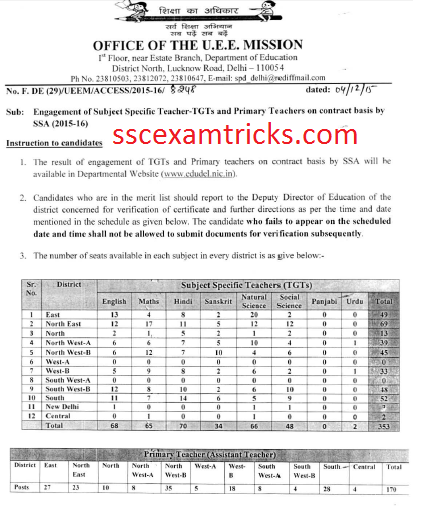 Delhi SSA Contract Teacher (Guest) Result 2015-16 Declared at Edudel.nic.in – Download Delhi Merit List for TGTs / Assistant Teacher (Primary Teacher): This is latest news that Edudel has publish notice for those candidates who have filled online application form for Delhi SSA Contract Teacher (Guest) that Edudel is going to be publish result on 05th December 2015 for the posts of Delhi SSA Contract Teacher – TGTs and Assistant Teacher (Primary School Teacher). The last date to resubmit the online application form for Invalid IDs candidates is given as 29th November 2015 up to 05:00 PM. on official website at www.edudel.nic.in. 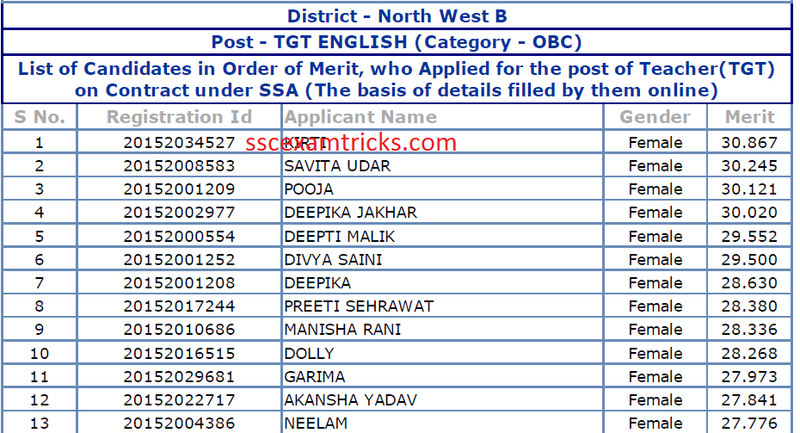 Delhi SSA TGTs/ PRTs Counseling Result Declared Check Selection List: The counseling was successfully conducted and completed on 07th December 2015 for recruitment of SSA TGTs & PRTs in DDE Office, Delhi. Date & Time of display of Counseling Result/ Selection List: 07th December 2015 at 05:00 PM. Date & Time of display of Counseling Result/ Selection List: 08th December 2015 at 05:00 PM. How to check Delhi SSA PRT TGT Result 2015-16: Click on above link and select district, post, category and gender from drop down list. 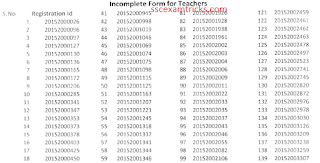 Click on the submit button and download the result of Delhi SSA Contract Teacher recruitment 2015-16. Edudel SSA Teacher (Contract/ Guest) Latest News 2015 for TGT & PRT in North, South, East and West Delhi: The latest updates is that Edudel is going to announce SSA contract teacher result for session 2015-16. According to the sources, the TGT & PRT Contract teacher result will be announced between 11:00 AM to 01:00 PM on www.edudel.nic.in. SSA Teacher Salary: Consolidated pay of Rs. 27800/-along with Govt. Holidays and one casual leave granted by the Edudel, Delhi board. Keep in Touch to get latest updates on Delhi Contract Teacher result and Check the direct link given here to downoad result of Delhi SSA contract teacher vacancy 2015-16 for TGTs (Elementary Teachers) and PRTs (Primary Teachers) based on CTET. Earlier Edudel was declared list of invalid IDs and candidates were required to resubmit their online application forms. The result was scheduled to be announced on 27th November 2015, but result has been postponed and resubmission of application from of Invalid IDs of candidates due to the Server Problem. 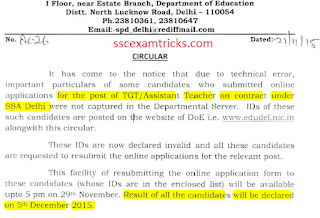 No Edudel Contract Teacher Result on 30th November 2015: It is rumor that some of the websites on the internet and some people on Facebook are showing Delhi SSA contract teacher result date on 30th November 2015 (just in one day after resubmitting online application form by Invalid ID candidates). 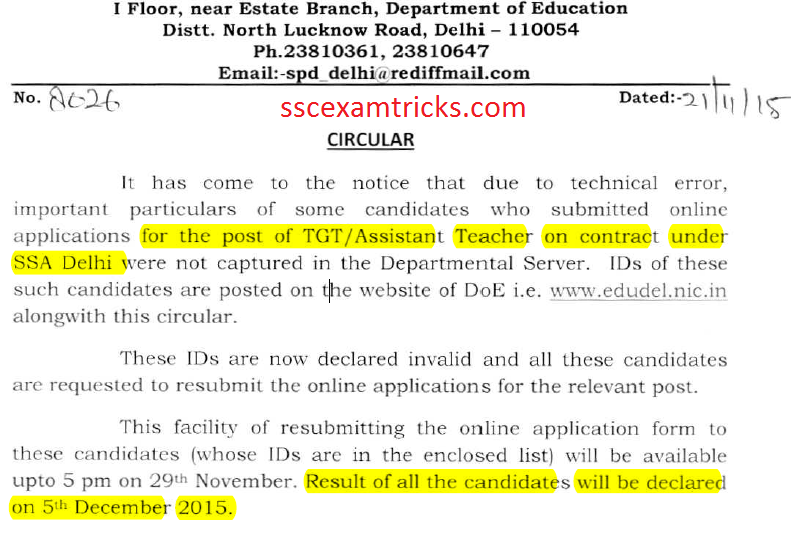 It is noted that Edudel has published notice in which it is clarified that Delhi SSA Contract Teacher 2015-16 for TGTs and Assistant Teacher (Primary Teacher) will be declared on 05th December 2015. 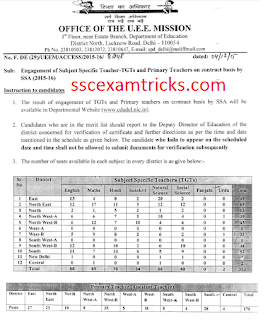 SscExamTricks.com is committed to provide you reliable and trustworthy information with latest updates on result, merit list, counseling of Delhi SSA contract Teacher 2015-16. So it is advised you to keep visiting us to get latest updates and stay alert. Note: The schedule presented here is expected and based on the observation & calculation of previous counseling conducted by Edudel, Delhi. The final schedule will be published on the official website. You are advised to visit official website for confirming Delhi SSA contract Teacher 2015-16 result, merit list, counseling schedule. Delhi SSA Contract Teacher Result 2015-16 Released - DELHI SSA Contract Teacher Joining Selection List Counseling Schedule: Edudel is under process to examine online application filled by the candidates for the posts of contract teachers in East, West, North and South regions of Delhi. The latest news is that Delhi SSA Contract Teacher result will be declared on 27th November 2015 on the official website at www.edudel.nic.in. 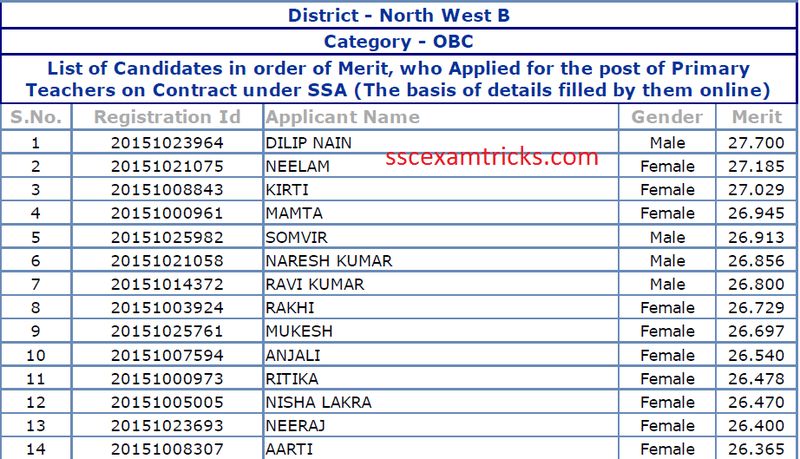 Those candidate who have applied and corrected their marks (up to two decimal point), they can check their result/ merit list from direct link available here. 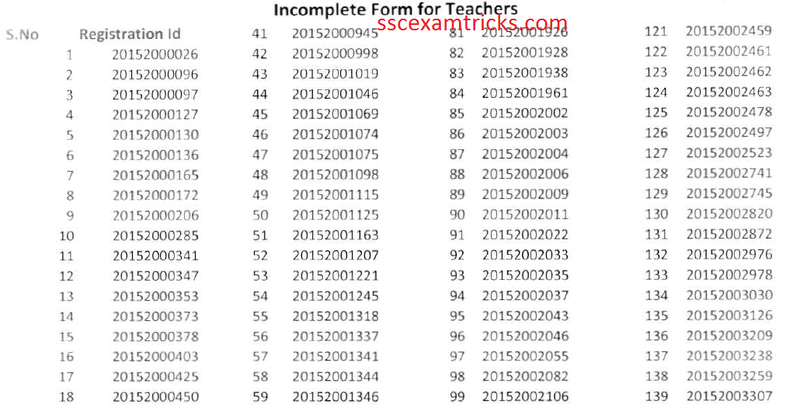 Delhi SSA Contract Teacher Rejected Application form list: Edudel has published list of invalid IDs of the TGT / Assistant Teachers due to incomplete application form filled by applicants on 21.11.2015 at www.edudel.nic.in. In this list, 732 candidates application IDs have been released. This list of invalid IDs can be downloaded here. Edudel.nic.in Delhi Latest News - DOE Guest Teacher Engagement 2015-16 List of Candidates for PRT, TGT & PGT in North Delhi, South Delhi, East Delhi, West Delhi, North-East, North-West Delhi. Edudel Delhi has released notification for engagement of Guest Teacher in the school of Directorate of Education (DOE) during session 2015-16. The notice has been in continuation to the previous notice released on date 26.06.2015.A list of candidates including name, father name, application ID, name of Post (PRT, TGT & PGT), Allotment School ID, Name of School and name of district (SW, NE, NW, East, Central, South, North). The candidates whose names are given in the list (annexed) will report to respective districts / schools during 20.07.2015 to 25.07.2015 for the processing of engagement subjected to fulfilling qualification as per RR’s and availability of record. All the terms and conditions of engagement of guest teacher will remain unchanged against reference to circular 26.06.2016. Delhi Guest Teacher 2015-16 Online Application Form - Download Delhi Contract Teacher 2015-16 Online application form Engagement for Recruitment of JBT/ PRT, TGT & PGT posts for Year 2015-16 Apply online edudel.nic.in. Directorate of Education, Delhi Govt. NCT is going to release notification for the engagement of Guest Teachers and Contract Teacher for posts of Assistant Teacher (Nursury), JBT/ PRT Teacher, TGT Teacher, PGT Teacher or Lecturer in various Government School for the academic year 2014-15. Delhi Guest Teacher / Delhi Contract Teacher Educational Qualification: The educational qualification for the post of PGT or Lecturer Guest Teacher / Contract Teacher will be PG degree in respective subjects. The candidates must be completed B. Ed. Diploma. The interested candidate must be Graduate with B. Ed. for TGT Guest Teacher / Contract Teacher Posts. The candidates must be completed JBT Course (two years) from recognized university / institute. The interest candidates must be CTET Level I, Level II & Level III for JBT/ PRT, TGT, PGT Posts respectively conducted by the Central Board of Secondary Education (CBSE). The candidates must have passed Hindi / English as subject in 10th Class/ 12th Class / Graduation for applying JBT/ PRT, TGT, PGT posts (as applicable). Delhi Guest Teacher / Contract Teacher Selection Process Selection List I, List II & List III: Those candidates who have completed CTET from CBSE will be preferred for preparing selection list of Delhi Guest Teacher / Contract Teacher for JBT / PRT, TGT & PGT. A merit list will be prepared based on the marks obtained by the candidates in academics & professional course. 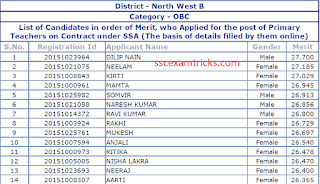 The merit number will be given in selection list released by Delhi Education Board on official website www.edudel.nic.in.